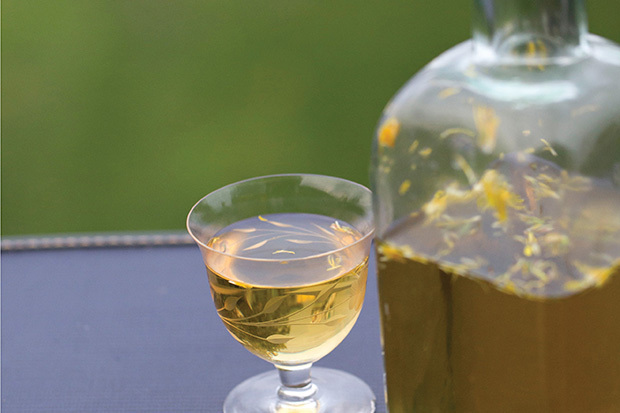 Dandelions are the bane of many a homeowner’s existence, but they can be transformed into the most delicious sunshine-filled liqueur (colloquially called wine) by making a dandelion tea (non-alcoholic) and then letting it ferment with sugar and citrus. You will find yourself creeping into neighbors’ yards to pick more blossoms, it’s just that good. Makes about 1 gallon. 1. Place dandelion flowers in a large heatproof container. Pour boiling water over top. Cover and let steep for at least 4 hours and up to 24 hours. When making dandelion wine, cleanliness is key. Make sure your kitchen counters, hands, and all utensils are sterile. 2. Pour the resulting tea through a fine-mesh strainer into a large pot or saucepan, pressing the petals to extract as much flavor as possible. Discard the blossoms and bring tea to a boil. 3. Place sugar in a heatproof 1-gallon jar. Pour boiling dandelion tea into jar and stir to dissolve. Add lemon and orange slices. Cover jar and let liquid stand for 2 weeks at room temperature, shaking every couple days. 4. Pour dandelion wine through a fine-mesh strainer lined with a coffee filter into a clean container. Serve or cover and store refrigerated for up to 3 weeks. Some of the flowers that make lovely flower wines include pink (dianthus), lilac, lavender, daylily, elderflower, violet, tulip, herb flowers, roses, and pansies. Swap in equal amounts of whatever flowers you like, except for lavender; because it has a particularly strong flavor, lavender should always be used in slightly smaller amounts. Bacher, Miche.(2013). Cooking with Flowers. Philadelpha, PA: Quirk Books.